It’s been a busy few weeks, y’all! I’ll get you up to speed. Working, packing, moving, cleaning, picking up take out, repeat. Busy. That sweet place we’ve called home for the past eight years officially belongs to another family now. We backed out of our driveway for the last time on Wednesday, left our keys behind and completed the closing on Thursday. It’s such a weird feeling at first, like strangers are living in your house. I do hope they enjoy it as much as we did; that house was really good to us. And even though I haven’t been thrilled about our temporary tiny apartment, I think it’s going to be really good to us too. We’ve made it cozy here and as we all sit on our couch and loveseat (positioned more like a sectional in this space) watching a movie, it suddenly feels right at home. Our furbabies have been total champs; I was a bit worried about our cats in particular, but they all act as if they’ve lived here all along after just a week. Phew! Big relief for this cat and dog mama! The only caveat to that is Max still feels the need to explore and sniff everything in sight when we take him out to go potty. I won’t necessarily mind the long potty breaks when the weather turns warm, but right now we’re still shivering after being outside for more than a couple minutes. I can’t wait for real spring weather! 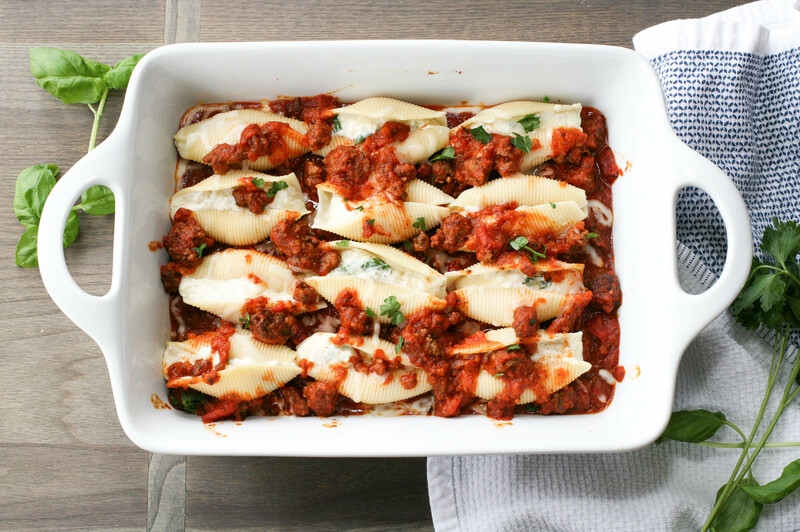 If we are going to be stuck with winter weather for a bit longer though, we might as well keep the warm comfort food baking and it doesn’t get much more comforting than cheesy stuffed shells in a garlic marinara meat sauce. Use a jar of pasta sauce from the store to keep it quick for a weeknight meal. I love Trader Joe’s roasted garlic marinara sauce! Once I season and brown the ground beef, I pour their sauce in the pan and mix well. While the meat is cooking, I cook the shells and whip up the filling in a mixing bowl – ricotta, mozzarella and parmesan cheeses, fresh basil and an egg. After that you just have to assemble and bake. Easy peasy! Spread of layer of sauce on the bottom of the pan, add the cheese stuffed shells, pour remaining sauce on top and sprinkle the last of the shredded mozzarella cheese to finish. Cover and bake for 30 minutes to let all those yummy cheeses melt together! I recommend garnishing with basil and parsley just before serving as well as making this on a Sunday, Monday or Tuesday so you can enjoy the perks of quick lunches or another dinner during the week thanks to leftovers. I think you should be able to freeze these as well. I would just skip the baking part and store them individually wrapped. This is how we freeze lasagna rolls my Grandma makes for us, each in its own sandwich bag after freezing on a baking sheet. You can pour extra sauce into a muffin pan, freeze and then store those ‘sauce cups’ in sandwich bags as well. This is another one of those recipes that’s easy to customize and change up for some variation in the world of dinners. Ground beef one week, sausage the next or maybe a combination of the two on a crazy weekend. You can also go for spinach instead of basil or turn it completely upside down and add chicken to your filling and top with alfredo sauce and parsley. Endless possibilities my friends. There’s no reason to make the same old thing for dinners week after week. That’s more of a reminder for myself, because I’m guilty of this sometimes. Just like those restaurants I only visit occasionally and therefore order the same delicious meal every time! What can I say, we all do it!! I mean, right, you guys too? 🙂 Have fun, be creative and let me know what pasta combination you end up trying first! Add ground beef to large skillet over medium heat. Crumble and cook until no longer pink. Season to taste (I use garlic and pepper). Drain as needed once cooked. Pour sauce in skillet, mix well and allow to simmer on low heat. While the meat is cooking, add shells to boiling water and cook according to al dente instructions on package. Drain and rinse with cold water. Add ricotta, 1 1/2 cups of mozzarella, grated parmesan, basil, egg, salt and pepper to a large mixing bowl. Stir to combine and mix well. Spread 1/2 of the meat sauce on the bottom of a 13x9 inch baking dish. Spoon cheese mixture into the pasta shells and place in baking dish. Pour remaining sauce over shells and sprinkle with remaining 1/2 cup of shredded mozzarella. Cover with foil and bake at 350 degrees for 30 minutes or until cheeses are thoroughly melted. Uncover and bake for an additional 5-10 minutes to brown as desired. Serve with salads and garlic bread on the side. Enjoy! *The original recipe calls for 15 ounces of ricotta cheese. It seemed like maybe just a bit too much the first time I made it. Can something really be too cheesy? I know! Based on your preference I'd go with anywhere from 12 - 15 ounces! This entry was posted in Dinner, Recipe Book and tagged cheese, comfort food, dinner, dinner recipe, easy pasta recipes, ground beef, ground beef recipes, italian, leftovers, pasta, pasta recipes, stuffed shells in meat sauce, stuffed shells recipe, three cheese stuffed shells, weeknight meals. Bookmark the permalink.